Championship Boxing comes back to Chester! Saturday April 12th sees the return of international boxing to Chester, with lightweight Chris Goodwin finally facing off against Irish warrior Oisin Fagan in a WBF inter-continental title fight. Goodwin (17-2-1) has been scheduled to fight Fagan on a number of occasions, and for a while it seemed like a match that was destined never to happen. Now, the pair will meet in what could be a candidate for fight of the year. Chester hot-shot Goodwin has only just returned after a 17 month lay off, winning his comeback fight with Maurycy Gojko over six rounds. However, he knows that facing Fagan, even at this stage of his career, is a far tougher proposition. Fagan’s record (27-8 16KO’s) is full to the brim with elite level fighters, such as Amir Khan and Julio Cesar Chavez Jnr. He comes with a fierce reputation and a ‘nerver say die’ spirit. Fagan never beats the world level fighters, but happily exposes anyone who isn’t at that class. This is what makes the fight so interesting. Chris is one fight away from fighting for the full WBF title, but if Chris isn’t of the class that the people of Chester think he is, then his dreams could come crashing down around his ears come fight night. The only thing that can be guaranteed is the fact that the fans will be in for a treat. It is also a night where Chris Goodwin will need all the support the city has to offer to get him over the finishing line. It’s going to be a cracker! When the ‘Spartan’, Paul Economides (13-5) faces Hungarian David Kanalas (14-10 7KO) for the WBF international super-bantamweight strap, fireworks will be assured. Now Economides is just two victories away from fighting for a world title. Yet in Kanalas, he has a potential banana skin in front of him. Kanalas is a former Hungarian champion, who though slightly fragile himself, always comes to fight and seems to possess a decent amount of power. If Economides loses this one it could well be the end of his career. Yet if he wins, he could be on the path to world glory. It is a real crossroads fight. Also on the bill is Solihull lightweight Antonio Counihan (2-0 1KO), plus a number of white collar fighters. So fight night is almost here. 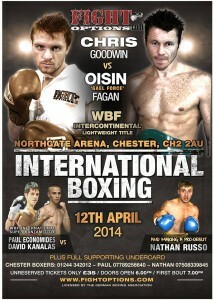 Remember to buy your tickets and get behind the Chester boys in their quest for a world title glory. Chester is about to hit the big time!